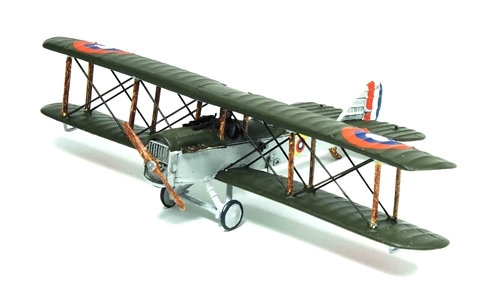 The Breguet 14 was a French biplane bomber and reconnaissance aircraft of World War I. It was built in very large numbers and production continued for many years after the end of the war. Apart from its widespread usage, it is known for being the first mass-produced aircraft to use large amounts of metal rather than wood in its structure. The Airco DH.4 was a British two-seat biplane day-bomber of the First World War. It was designed by Geoffrey de Havilland (hence "DH") for Airco, and was the first British two seat light day-bomber to have an effective defensive armament.